We find it odd how many consumers relate effectiveness to size. If, for example, they compared a small snow blower with a big snow blower, they’d likely say: The latter is more powerful and sturdy and therefore better than the former. The snow blower industry has long since proven many times over that this isn’t always the case. In fact, there are instances in which small snow blowers—especially the best small snow blowers currently available in the market—are more effective than big snow blowers. Coming in at 14 x 58.7 x 14.6 in dimensions, as well as 13.8 lbs in weight (16.8 lbs when shipped), there’s little doubt in our minds that you’d find the Snow Joe 323E 10-amp Electric Snow Shovel exceptionally maneuverable. A wet mop could be heavier than it. But to ensure that all users will be able to use their models of it comfortably, Snow Joe gave it an ergonomic design. It comes with an adjustable ergonomic handle with a distinct curve that reduces strain and thereby helps prevent fatigue. 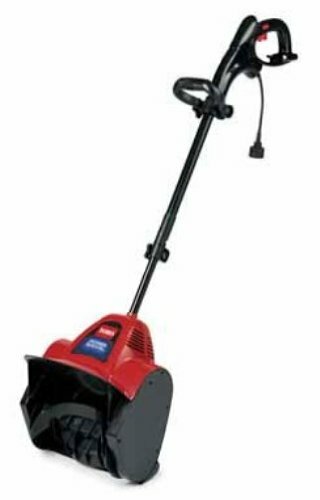 But hold on to the Snow Joe 323E 10-amp Electric Snow Thrower tightly during use. It’s surprisingly powerful for a handheld electric snow blower. In just one minute, it can move up to 400 lbs of snow to a maximum distance of 20 ft away. It can also cut a 13″ wide 4″ deep path through snow in just one pass. This is made possible by its paddle auger, which is made of quality sturdy material. It also comes with a key lock feature, which keeps it from being used by strangers or stolen, and a 2-year full warranty. To run for as long as you’d need it, the Snow Joe comes with a 10-amp cord. While necessary, a few consumers have complained about how it limits their reach and thus renders the handheld electric snow blower itself not as maneuverable or convenient to use which is as expected with other electric-corded snow blowers. Although it appears easy to assemble at first glance, a fellow reviewer find it a bit more complicated that it took some time putting it together. Nevertheless, it has received a commendable rating of 4.4 stars out of 5 on Amazon, where it’s currently being sold with shipping will be free of charge. Ideal for quick snow pickups on decks, steps, patios and sidewalks. Powerful 10-amp motor moves up to 400 lbs of snow per minute. 2-blade paddle auger cuts 13 in. wide and 6 in. deep with each pass. Ergonomic design with adjustable handle to minimize user strain. CSA approved; Full 2-year warranty. The Toro 38361 isa bit pricier than the handheld electric snow blower reviewed previously, so it would be no surprise if you’d expect a lot from it. We assure you: It comes with features that justify its cost. The Toro 38361 is, more or less, 4 lbs lighter than the handheld electric snow blower reviewed previously. But it can move a maximum of 300 lbs of snow a minute to a maximum distance of 20 ft away, as well as cut a 12″ wide 6″ deep path through snow in just one pass. Its superior power to weight ratio ensures you’ll be able to maneuver it easier than the other snow blower and thus deal with the white stuff more effectively. It also comes with a metal telescopic handle, cord-lock system, durable plastic body with rust-resistant parts, and 2-year full warranty. Together, these features ensure it will be comfortable to use, won’t cause you to have an accident during use, and can withstand a lot of wear and tear. Some consumers, however, beg to differ. The Toro 38361 isn’t as sturdy as it should be, according to them. The other drawbacks to it that some other consumers have pointed out are: switching it on isn’t as simple as it should be, its chute is so small it tends to clog, its wheels are so small they render it not as maneuverable as expected, and its extension cord is a hassle. Nonetheless, it has received the same commendable rating on Amazon as the handheld electric snow blower reviewed previously, which proves it is exceptional. 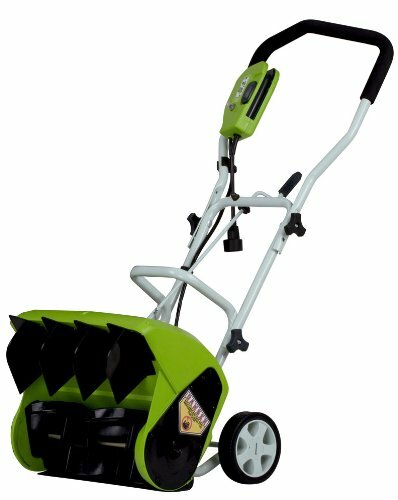 Not only is the GreenWorks 26022 10 Amp 16″ Corded Snow Thrower the heftiest snow blower on this list (it measures 23.03″ x 42.5″ x 19.29″ in dimensions, as well as 26 lbs in weight); it’s also the priciest. But if you value versatility above all a snow blower’s features, we trust it will be perfect for you. Despite being heavier than both the handheld electric snow blowers reviewed previously, the GreenWorks 26022 Snow Thrower is surprisingly still compact and easily maneuverable. Its ergonomic rubber handles are adjustable in height to let allow you better comfort and safe handling. It will also make you feel like your slicing through butter with a hot knife. This is made possible by its innovative designed but effective back wheels, impellers and snow-blowing mechanism. It also comes with a 14″ impeller that enables you to cut a 16″ wide path through snow and thereby move more snow than with either of the both the handheld electric snow blowers reviewed previously. Don’t worry that you might hit somebody or something with ballistic snow during use, it can fire up the snow in a distance of 25 feet. It will fire up quick and easy even on a frigid day. And it has cord lock that holds the extension cord securely in place, so you don’t have to worry about the cord getting in the way. Thus, it’s a truly versatile snow blower indeed. While the GreenWorks 26022 is packs great features, few consumers felt its materials may tend to wear and tear easily so you may need to put extra care handling it. It, however, has received the same laudable rating of 4 out of 5 stars, which proves it is one of the best small snow blowers currently available in the market. Discharge distance: Up to 25-ft.
As we hope to have made you realize by way of the above reviews of the three small snow blowers we find exceptional, size does matter but not in the way that many assume. It isn’t a reliable indication of effectiveness. Indeed, the three snow blowers are remarkably effective despite being compact, proving there’s more to finding the perfect snow blower for you than just focusing on what you see at first glance. You have to be even more discriminating. You’ll be surprised with what you find.